My mother in law passed away unexpectedly as I was leaving for the San Diego Art festival, and my husband was flying east for a business trip. Parallel to festival commitments, and business travel, the process of juggling out-of-state loss began; death certificates, additional travel, burial arrangements and notifications. While we were in different cities, on phone calls, getting adjusted to the forever-ness of this new absence, I took respite in night time art-making. Emersion in pigment swirling, shape-making, and the wonder of stacked, transparent colors is both an escape from sad thoughts, and comforting, solid company. Painting as a process is strong enough to lean on while stepping timidly down the stairs of bereavement. Every rough patch of road in my personal history leaves me swelling with gratitude for the refuge of art, which I’ve turned to again and again. My mother-in-law raised birds for decades. She hand-fed parrots and cockatiels so they’d be socialized and comfortable around people holding them, talking to them and loving them. Her birds were her babies, and over the years, she avoided long-distance travel or attending events that would take her far from her chicks for any length of time. It feels fitting to put a bird figurine in this watercolor, while I think about her life, her sons, and what was important to her. There is a definition of the five stages of grief, as though wrapping containment around each passage serves the finality of loss in a more bite-sized, digestible way. Perhaps in my own organization of shapes in a painting, I’m doing the same thing; tending passages of color like a farmer tends crops, staying busy while I process a departure, one color at a time. In this piece, a young man searches for poems about grief to help cope with the loss of his father, and when he doesn’t find what he’s looking for, he writes them himself. Author & Artist Austin Kleon assembled this list of artist’s quotes about the cure of drawing. Read it here. A branch of bereavement, to me, is our perspective on time. How many circles around the sun do we each get to complete? With loss, I inevitably think about my own mortality. I’m not being morose… The notion of limited-time can lasso distraction and force an inventory of what’s really important. It’s an alarm clock of motivating perspective. I think about the stockpile of ideas, photos and sketches I’ve stashed, waiting to become art. And then I wonder how I would prioritize my time to get them finished if I had a clock ticking with a visible end in sight. Would that motivate you? Sometimes, artists let fears drive the bus, thinking we’ve got all the time in the world, and that stops us from diving into art-making with the conviction of everything we’ve got, regardless of the outcome. Well, I want to drive my own darned bus, and to hell with all-the-fears. What about you? There’s so much to do, and who knows what our timeline looks like? I wonder what personal projects my mother in law planned for this summer, and what were the things she meant to get to, but didn’t. If she were looking over my shoulder, she’d probably say Quit typing and Grab a brush. The paper under this watercolor is newish to me, and I’m experimenting with transparent, glazed layers, and lifting non-staining colors with a clean, wet brush to lighten shapes. 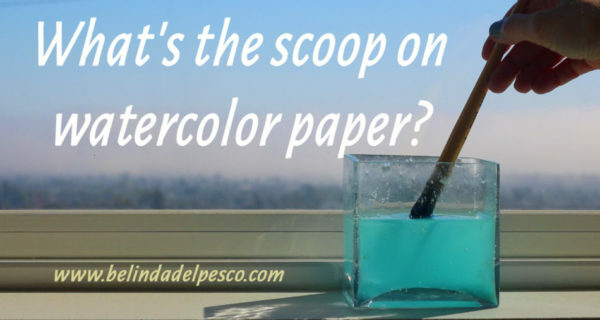 I usually paint on plate finish or hot press paper; both are slippery smooth and leave all sorts of pigment-piles with brush marks here and there. In contrast, this paper has a lot of tooth (nooks and crannies or a pebbly-surface), so the pigments spread over the miniature expanse of hills and valleys, and sink into place in an evenly dispersed veil. This weight (300lb) paper doesn’t need to be stretched or mounted before painting. I taped it to a board so I could work on the painting while standing at my easel at an art festival. Have you tried Arches 300 lb rough, and if so, which media do you use on it? Watercolor? Acrylics? Alcohol Inks? 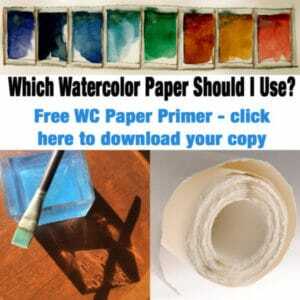 Click the rinse-water to download a three page primer on Watercolor paper – everything about surfaces, weights, manufacturers, etc. I think now is a good time to shut down my browser, grab some tea, and break out my watercolor palette for some painting today. What do you think? Can you join me? Even just for 15 minutes of swirls and doodles? With that free pen from the bank, on the back of a utility bill? Draw me a flower, or a map of the back yard. Anything will do. Drawing isn’t work, it’s a form of prayer. Using creativity and painting with watercolors as a means to move through loss, grief and bereavement, with links to other resources to help move through a death in the family. This post was so soothing to my soul. I just love your blog, and I share it with my class of senior artists who have just re-entered the realm after a life of working and the busy life. This post is particularly encouraging. I am sorry to hear about your losing this woman so close to you, but so enjoyed your approach to thinking about it and working through it. Making art is truly a salve for the soul! Well spoken. Bless you. Hi Mary – Thank YOU for such a generous comment, and for helping map the way back to art and creativity for senior artists! A return to art-making after a long and busy life is a sweet homecoming, and I’m grateful that you’re leading the way so others find themselves in the process. Thanks for your kind words. B.
I’m sorry for your loss, and grateful for this post. Especially the quote about drawing. I need to go get lost in work. Hi Kristen, I clink my drawing pencils to yours in a toast towards getting back to it! Thanks for your kind words. My condolences to you and your husband, Belinda. And thank you for writing such a heartfelt and inspiring post. The keys to my bus must be here somewhere — I’m eager to start driving again!! Sending sympathies to you & your family. It’s so tough to lose someone you love, but you have painted the most beautiful tribute to your mother-in-law. I love your style so much. Thank you again, Belinda, for such a personal, meaningful post on the healing refuge of art. You’ve created a beautiful painting in your mother-in-law’s honor. Victor Hugo’s poem is so beautiful, powerful and poignant. Condolences to your husband and to you on your painful loss. Thank you, Kathleen, fo your wonderful feedback, and your generous encouragement. And your condolences. You are good company in this jagged passage. Belinda, I’m so sorry for your loss. Please give my condolences to your husband. As always, even in the midst of sorrow, your post is lovely and inspirational. I’m joining you. The minute I hit enter, I’m going to pick up my brushes. I have a floral that has been sitting for three days waiting for me to finish it. Snow Finch and Rubies turned out great. Hi Candy, Thanks for your nice note. I hope you are lost in the pigments of your floral watercolor, and furry littles are snoring close by, deeply contended by your creative atmosphere. Happy painting to you. So sorry for you and your husbands loss. The painting is a beautiful tribute to the love you have for her. My deepest sympathies for your loss. Your work is beautiful. Thank you, Tatiana. I appreciate your encouragement. My condolences, Belinda, to you and your family. I think the right side of the brain IS better at dealing with grief. Go well. Thank you, my friend. Here’s to our creative hemispheres… onward and flourishing.